Thirumananjeri is located 3 kilometer to the west of Kuthalam, Thanjavur district in the state of Tamilnadu. This place is 15 kilometer from Mayiladuthurai. Once upon a time, Parvathy wanted to marry Shiva in an earthly marriage with all religious rites on the earth; Brahma, Vishnu and Indira came to earth as acharya in Thiruvaduthurai; while playing chokkattan (similar to Thaayam), Vishnu won and his sister Parvathy laughed aloud; Lord Shiva was angry and said “Ada pasuve!” and Parvathy was born as a cow on earth; Vishnu became her herder at Therazhundur; Barathamuni had no children and he prayed the Lord; he was given permission to remove her curse and so he converted her cow shape to a feminine figure at Thiruvavaduthurai; she grew up at Kuthalam alias Thiruthuruthi in Bharathamuni’s house; Lord Shiva came to marry her as promised earlier and Barathamuni received him at Ethirkolpadi; Shiva performed all the marriage rites / velvi at Velvikkudi before marriage; then he married Parvathy at Thirumanancheri. Shiva hence gets the name ‘Pasupathy’. The following story also keeps floating around: Two girls promised each other that their son and daughter would marry in future; one got a beautiful girl while the other gave birth to a turtle-shaped boy; former refused the marriage; the latter appealed to the Lord; he converted the turtle to a handsome young man; marriage went off well; so goes the story; hence the belief is that the physical disabilities of the spouse will be either corrected by the Lord or overlooked by the other spouse; hence the marriage obstacles would be removed once you come and pray here. To bless the devout multitude on earth Lord Shiva and Parvathi got married in five different types. The celestial wedding that took place in this sacred spot was performed according to the sastras followed by human beings. When Shiva and Parvathi were in a happy mood in their abode in MT Kailash a strange idea struck Parvathi. Instead of the usual fight that separates the couple after which they unite in wedlock , Parvathi thought it correct and logical to request Shiva to marry her another time. Parvathi requested Shiva to marry her again which he accepted with joy and also informed the time of their wedding. Parvathi became impatient as there was a fairly long time for the marriage. She became callous and cold shouldered Shiva. Shiva watched her behavior and in a fit of anger cursed her to be separated from him and take the form of a cow. Parvathi incarnated as a cow and roamed in the jungle. She was always thinking of her spouse while loitering in Asukadau( forest) he divine cow -Parvathi spotted a Lingam and showered it with milk from its udder. Shiva was overjoyed to see the devotion of his consort. Shiva happy with Parvathi’s (cow)deeds and granted Mukthi to her Thiruvavaduthurai. He was contemplating as to how Parvathi could be born on earth so that he can marry her quickly. Lord Shiva appeared in the dream of Sage Bharatha, that he will enter into wedlock with the celestial who appeared from Sage Kundam. Thus the Sage meticulously looked after the wedding arrangements. 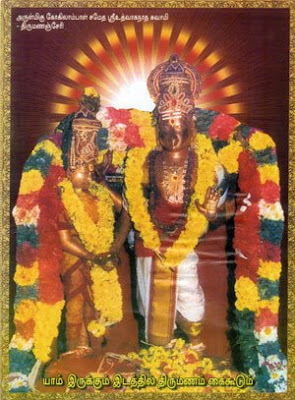 The divine wedding took place in Thirumananjeri which was witnessed by celestial beings. Since the Thirumanam (Wedding) took place at Thirumananjeri, this place is called Thirumananjeri. There is a popular belief that unmarried men and women will get married by worshipping the Lord and his consort. All the pooja items which is required to propitiate the deities are available inside the temple. But there are shops adjoining the temple who sell the pooja items. There are many unmarried men and women who are grouped to propitiate the deities. The priests conduct the rituals precisely and the pooja with the reverence. Rathi and Manmadhan were united in wedlock in Thirumananjeri. One should visit Thirumananjeri only after completing their visits to other places. This temple should be the last leg in their tour. Faith can move mountains. Reposing faith in the deities will do wonders. Unmaried men and women who prayed for their wedding should compulsorily visit Thirumanajeri after their wedding and follow the ritual as ordained by the priests. There is a separate shrine for Rahu of the Navagraha. The childless will get a progeny if they worship him thus called Mangale Rahu and worshipping him consecutively on three New Moon days will remove the malefice effects of Navagraha. Car Parking is available in front of the gopuram on normal days; on weekends it is difficult to get parking. Leave chappals in the car itself, if possible. Buy archana thattu/bag INSIDE the temple, not in the outside shops though shopkeepers will keep pestering you. Buy ghee dheepam thattu near the archana counter, not outside. If possible, take original ghee from home since ghee sold there may be dalda. Clay lamps are available there (or we can take from home). Step-1: Go into the temple; Selva Ganapathy is on the left of sanctum sanctorum: pray before him first. Step-2: Pray Lord Shiva (Sri Uthvaganatha Swami) next and go to Amman Sannithi on the right. 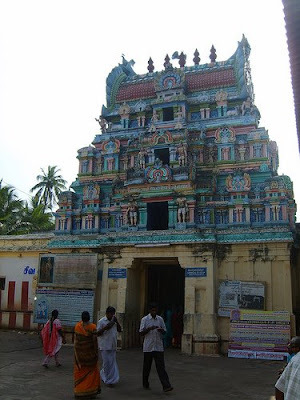 Meenakshi Amman here appears as a 13-year old Kokilambal, head slanted to her right, with three bends (”naanikkoni’). This kolam is before her marriage. Step-3: On the left of this mandapam is the important Kalyana Sundareswarar sannithi and mandapam. Light the ghee deepams first, right opposite to the Kalyana sundareswarar sannithi (except for mangala raagu which has separate place for ghee dheepams); here the deities are in marriage kolam; Meenakshi is on his right looking at the floor in kalyana kolam; hence married girls should always stand on the right hand side of the groom during all auspicious functions; the priests perform the rituals here to remove our marriage obstacles. Details are given below. Unmarried spouse should buy one set of archanai thattu/bag; there are two places where you can buy this thattu; there are ten shops just outside the temple which sell this thattu at Rs.80 for boys and Rs.90 for girls [because manjal kayiru is added] containing 2 garlands, 2 coconuts, one lemon, vetrilai paaku, kalkandu; the same thattu is available inside the temple also at Govt (HR&CE Dept)-fixed price of Rs.40 & 45 sold by an HR&CE employee; always buy it inside the temple in Tanjore temples. As soon as you enter the Kalyanasundareswarar sannithi, light the dheepams first and then wait for the next batch; only girls and boys concerned are seated inside the enclosure and those accompanying should sit around this enclosure; couples who come after marriage to complete the rituals and the parents (of boys/girls who are unable to come in person) also can sit inside the enclosure; if you are parent(s) inform the priest as soon as you enter the enclosure. The priests brief you first regarding the Do’s and Don’ts; then collect all the garlands and the archana tickets first; they keep all garlands at the feet of the god, return one garland each to the spouse to be worn, parents must keep it in their hands; sangalpam is done and the thattu is taken away; parents should tell the boy/girl’s gothram/name/star and not theirs; archana follows, coconuts are broken, thattus are returned after aarthi as usual; drop Rs.10 or so in the thattu for the priests. Vibuthi, kumkum (plus manjal for girls) are to be used, after prayers, for one mandalam (45 days or till they last) by the boys/girls only and NOT by others in the family. Lemon should be drunk, without adding salt or sugar, by the boys/girls only and NOT by others; the next morning after bathing the boy/girl should pray wearing this garland and then drink the lemon juice with a little water. Then retain the garland in a cloth bag (manjal pai), not in plastic bag, till marriage is over and come again with spouse; the same garland is finally put in the temple tank here. Coconuts can be used by the entire family for cooking. Step-4: After these rituals at the Kalyana sundareswarar sannithi, go and pray Shiva again. Normally no separate archana is done here. Step-5: The kalyana melam/Nadhaswaram party collects Rs.10/boy or girl while coming out of the sanctum sanctorum, though not compulsory. Full procedure for Puthira dosha pariharam:: take bath in the thirukkulam nearby on amavasai day and take paal payasam for puthira bagyam; childless couple should offer ghee which is returned as prasadam which is to be taken at night for 48 days by both. From Kumbakonam : Take SH64 towards Mayuram, go 16km to Aduthurai, 11 km to Kuthalam, take left 8km to Thirumananjeri = 35 km approx. Faster route but cannot visit Suryanar Temple if you want to. Another route from Kumbakonam : Take SH64 towards Mayuram, go 16km to Aduthurai, take left 4 km to Suryanar kovil, 6 km to Kanchanur, 9km to Thirumanancheri = 35 km approx. One Should visit the temple to get the bliss. Thanks for your detailed information about pooja procedure. It will be very useful for eveyone. Now Iam confident to visit this temple without confusion. I can concentrate on prayer in the temple. Any Idea for people with krithika nakshatra as birth star?